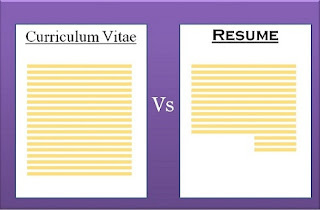 CV vs. Resume : The Difference and when to use which ? When you apply for a job, it's important to provide some piece of marketing collateral -- but should it be a resume, or a CV? Both of these terms get thrown around a lot, and most of the people use them interchangeably. It's important for the job-seekers to understand that these two types of documents are not the same thing. 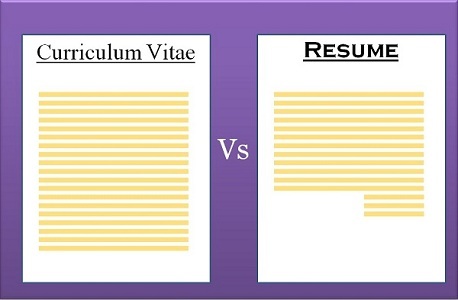 CV is an abbreviation for Curriculum Vitae. If a job advertisement asks for a CV, that's a hint that the employer expects a great deal of life experience and accomplishments, including education, original research, presentations you've given and papers or books you've had published. CV's usually don't provide a lot of details for each job listed. Most job-seekers are more familiar with resumes, a resume is a written compilation of your education, work experience, credentials, and accomplishments that is used to apply for jobs. You need to customize your resume to each job you apply for . It is by no mean a static thing.